My daughter loves eating pastries of any kind, but she’s especially fond of chocolate croissants. She’s pretty impressed I don’t eat them anymore. About a year ago I stopped eating gluten all together. I stopped not because it’s the hot trendy thing to do, but because I discovered my digestion could actually be normal without it and let’s just say it was not normal for most of my adult life. So, this morning, as my daughter and I were lounging around in our pjs, I asked her what she’d like for breakfast. I offered to make (Pamela’s gluten-free) pancakes? fruit? a smoothie? scrambled eggs? fried eggs? cereal? and with a smile, she answered “a pastry”… “hmmmm… what kind of pastry were you craving?” I asked. “A chocolate croissant”, she said. “You really like those, huh?”, I asked. Her response was about as good a rationalization as any I’ve heard yet for eating pastries: “As I see it, it’s good to eat a lot of pastries in case you decide to go gluten-free. I figure it’s easier to live without gluten if you’ve already eaten your fair share of pastries” and then she added “it seemed to work for you, mom.” HA! I hadn’t thought of it quite like that, but it’s true I’d eaten plenty of pastries over the years. Then one day, just like that, I stopped. I haven’t so much as considered eating one again. Perhaps that’s because I’ve already eaten my fair share? 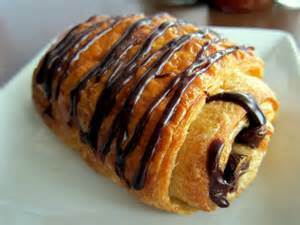 Ohh chocolate croissants are my weakness! I haven’t had them in years since I found out I had celiac disease though. These look delicious! Sorry for the delayed response. I agree… and it’s pretty much impossible to find anything that even comes close to a chocolate croissant when you can’t eat gluten. boo hoo.